Let's start where it all begins, with the cheese. Mons' cheeses are, as usual, amazing. Whole Foods carries a couple of his raw-milk Poitou cheeses (including a Chabichou), but at close to $20 per cheese, they are prohibitively expensive. On the other end of the financial spectrum, his red-mottled Camembert ($10.99 per wheel) is the best pasteurized version I've ever tasted and is a steal at that price. They also carry some local favorites including cheeses from Sprout Creek and Nettle Meadow (the latter of whom makes an amazing bloomy-rind triple-crème cheese called Kunik). The nice thing about having a climate-controlled room is that all the fresh soft cheeses can be displayed out in the open (rather than in a refrigerated case). Though I'm sure the staff are constantly telling people to keep their hands off the cheeses, seeing cheese sold like this is really quite appetizing. If you can get to it, that is. They've designed the Fromagerie in the most obtuse way possible. They put it behind a couple of sliding glass doors toward the back of the store. Despite the writing on the glass beckoning shoppers to enter and ask questions and try the cheeses, the room from the outside looks like an employee-only back room. Additionally, right outside of those glass doors is a giant case full of pre-cut cheeses. 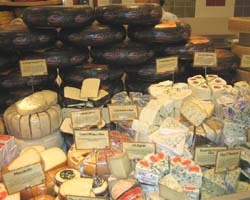 You could easily do all your cheese-shopping without stepping foot in the Fromagerie if you didn't know any better. Another problem is the store's location. I am used to shopping in the Union Square location, which is jam-packed almost any hour of any day. But when I walked into the Bowery location, the place was eerily quiet. Now, granted, it was 9am on a Friday morning, but I would wager that the Union Square location was already hopping at that hour. And if you think about it, there's just not that much foot-traffic at Houston and Bowery; it's a much more residential neighborhood, one that is much more poorly served by public transportation. Let's face it, Union Square is one of the most heavily-trafficked areas in the city. I think that Whole Foods would've been much smarter to have built the Fromagerie in the Union Square location (or even Chelsea or Columbus Circle), but in its current incarnation I fear that the concept will never take off. In all it was an enjoyable experience shopping at the Fromagerie (even though the corporate bigwigs there wouldn't let me take any pictures); the cheese is kept well, there's a nice, varied selection, and the staff is quite knowledgeable. However, given it's location both in the store and in the city as a whole, I think the place is ultimately doomed. I hope they don't abandon the idea entirely; it would great to see something like this in all the Whole Foods stores!